There has been a beautiful 1950s hat gazing dreamily at me from my Pinterest boards for a while now. "Create me..." it whispered. Today it was finally time. The story of this hat is a recycling story too. 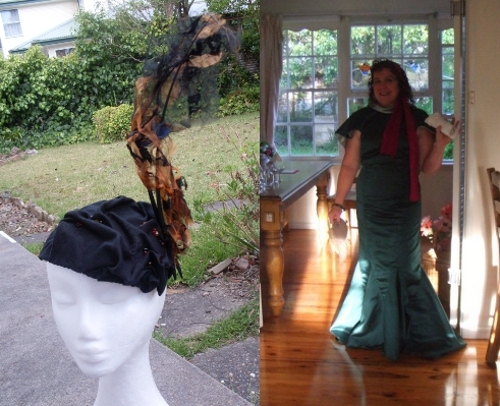 The other day I disassembled my bushfire hat because I didn't like the fabric on the base, but I wanted to re-use my flame-and-smoke. This left me with a nice buckram base to use. Then there's my 1930s Vintage Vogue dress. It was a somewhat unfortunate attempt. It was ok for a costume, but when I sat down I threatened to split the seams. I don't even have any photos of me wearing it. I gave it to Mum, and she wore it for my "How to Marry a Millionaire" party, but she decided it was too long for her. On my trip to Wales, I took it back, planning to "fix" it. I've developed an aversion to machine sewing. It may be related to the position of my sewing machine at the back of the desk behind piles of stuff. A good thing about using the dress was being able to use the ties from the back, with the two greens already stitched together! Victory for me. The bling is a brooch scored at Chester's best charity shop. For a pound. Bargain! What else should I refashion this dress into? And what other amazing vintage hats should I do a version of? Yesterday evening I discovered British Pathe and I did not get to bed on time, let me tell you. This amazing collection of video footage from 1890 onwards includes plenty of fashion. My fondness for vintage styles should be evident to anyone who has even glanced at my work, so you can imagine how much I was loving this. If you search for hats you'll get a few unusual things, but mostly footage from fashion shows. The commentary is often hilarious, but gives you a great insight into the fashion direction of the time and describes the colours in black-and-white footage. A video of hat fashions at London Zoo inspired by the animals has some great hats but shows that the ethics of even our standard unethical clothing have come a long way! "Don't worry, the trimming's ermine, not penguin." Phew! Am I glad to hear that. I have a book on how to make hats by Aage Thaarup and thanks to a video of his Easter bonnets I have seen more of his work and learned how to pronounce his name! His adaptation of "the Aussie bush hat" is nothing like that description, but it is very pretty. How many times can you say Australian in 10 seconds? This 1947 video of Australian spring fashion tries for a record. Any man would be proud of you in that dress. Interestingly there is a model called Dawn Fraser, at one stage modelling a swimsuit. In other news I am slowly getting back into the swing of things after my holiday. They are so wonderful but so disruptive, aren't they? I did make a daily hat this week, but I didn't post it at the time as I was deciding whether to add more to it or not. I decided not. 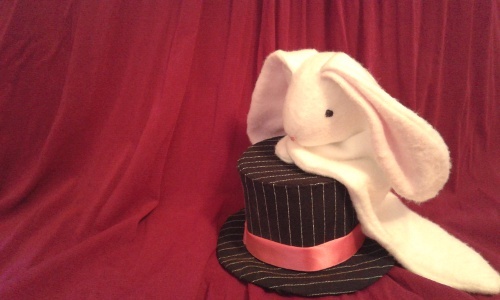 I used this mini top hat in a photo shoot with the Bunny lovey dovey over at the old Jupiter Hollow blog. I referred to this as "my first ever hat". In fact, it was the first hat I made attempting proper millinery techniques after Rhiannon gave me my first millinery book. I had made a few costume hats before that using more innovative techniques (staples and cardboard, for example). Staying with Mum on my recent holiday, I was reunited with some of my first ever sewing projects, two lovely mice made from kits. What do you know? 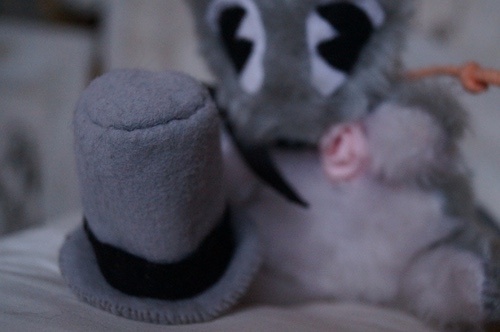 They both have cute little hats! "Gary Groom" has a darling top hat for his big day, and I love the patched-up cap that "Conkers" is sporting.